Provides an excellent system to protect cables and wiring from dirt, abrasion, sun and water. 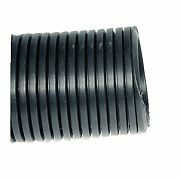 The molded polypropylene flange is internally threaded to retain hose and to make rigging adjustment simple. Hose is durable, flexible, and kink resistant. Molded vinyl cap provides a closure for the engine end of hose if needed.